Help AMSAT launch Fox-1C satellite in 2015! The Radio Amateur Satellite Corporation (AMSAT) hasn't added a story. 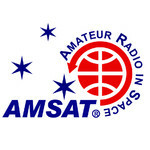 AMSAT is a group of radio hobbyists that build and launch satellites that provide communications and carry experiments for ham radio users and space enthusiasts around the world. Our satellites are completely open for anyone to listen and any licensed ham to transmit through. We are celebrating our 45th year of making and keeing ham radio in space. 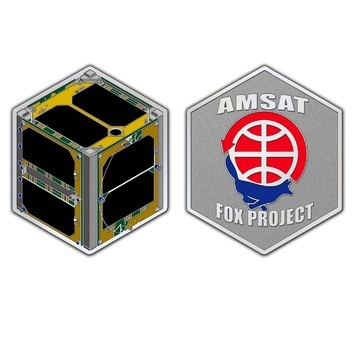 AMSAT is excited to announce a launch opportunity for the Fox-1C Cubesat. AMSAT has teamed with Spaceflight Inc. for integration and launch utilizing Spaceflight’s SHERPA system to a sun-synchronous orbit in the third quarter of 2015. Fox-1C is the third of four Fox-1 series satellites under development, with Fox-1A and RadFXsat/Fox-1B launching through the NASA ELANA program. Fox-1C will carry an FM repeater system for amateur radio use by radio hams and listeners worldwide, and has available payload space for educational and non-profit experiment boards. Further details on the satellite and launch will be made available as soon as released. The Radio Amateur Satellite Corporation (AMSAT) hasn't posted any updates yet. 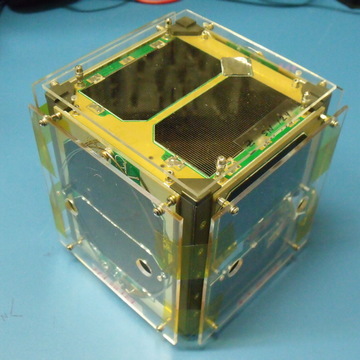 This challenge coin is shaped as an isometric view of a Fox-1 CubeSat, complete with details such as the stowed UHF antenna, solar cells, and camera lens viewport. Struck in 3mm thick brass, plated with antique silver, and finished in bright enamel, the coin is scaled to be approximately 1:4 scale, or 1 inch along each of the six sides. The reverse has the AMSAT Fox logo. For a $1,000 donation, we will provide you after launch with a clear solar panel protective cover actually used on Fox-1C. We'll mount the cover on a plaque, and engrave your name and callsign, and date of launch. Display the cover in your office or shack, and be proud that you helped AMSAT launch Fox-1C! The Radio Amateur Satellite Corporation (AMSAT) is managing the funds for this campaign.